If your Monday is dragging on too long, you might try blaming it on cosmic rays. In a paper published Friday by the journal Geophysical Research Letters, physicists from Paris and Moscow propose that the high energy protons and nuclei might have a surprising influence on Earth's length of day. The team claims that a previously noticed relationship between fluctuations in the length of day and the 11-year solar-cycle are actually caused by cosmic rays. One of the team members, Vincent Courtillot of the Institute of Geophysics of Paris, says they examined the length of day -- as defined by the speed of the earth's rotation in a reference frame fixed with respect to the stars -- using a series of daily values over a 40 year period. They claim that up to 30-percent of changes could be directly related to the 11-year sunspot cycle. Of course, 30-percent of that change only amounts to a few tenths of a millisecond, so you'd never actually notice it, but what's more compelling (read 'very highly controversial') is the potential for cosmic-rays to have such a profound affect. Courtillot and his colleagues have been among those championing a radical theory that cosmic rays can impact the formation of clouds and in turn, play a major part in climate changes. But how could cosmic rays possibly change the speed of our planet's rotation? "The causal chain is the following: the changes in Earth rotation are simply reflecting the changes in angular momentum of the Earth's atmosphere, more precisely the integral of zonal winds. And it has been suggested that cosmic rays influence cloud condensation nuclei formation. If you change the cloud cover by say 10-percent, you change the amount of energy reflected by cloud tops by 8 Watts per square meter, which is very significant in the Earth's radiative budget. So this is the suggested link: cosmic rays affect cloud cover, which affects the atmosphere's energy budget, which may alter the wind speeds and organization, which changes the Earth's angular momentum hence (length of day)." 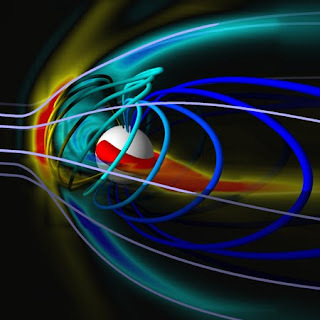 It may sound like a reach (and relationships don't prove causation), but other physicists have claimed that the sun's magnetic field could potentially beat back cosmic rays and slow the rate at which they reach Earth. So when solar activity decreases there's less to deflect the cosmic rays and they can again reach Earth in greater numbers, potentially leading to a substantial enough change in winds to affect Earth's angular momentum. Cosmic ray has played the main role uninterrupted spreading in the universe as it took up the responsibility or acted as helper for the visible advent or for the different forms of the single matter. This may support the hypothesis that all time is local due to being generated in the star and influencing only that star's own system. There might be a way to test that if we are still in contact with Voyager. If the star produces a particle causing time, its abundance will decrease with distance. Voyager's distance should be adequate to produce a signal delay greater than the delay due to its distance plus the delay in the electronics. What about the result of CERN "CLOUD" experiment launched after interesting result raised by "SKY"? maybe the results are not yet out?